The Gold Mount is the 3rd generation of Anton Bauer's snap-on system which has been an industry standard for 30 years. PowerTap receptacles allow DC accessories like microphones or lights to be powered by the camera battery. 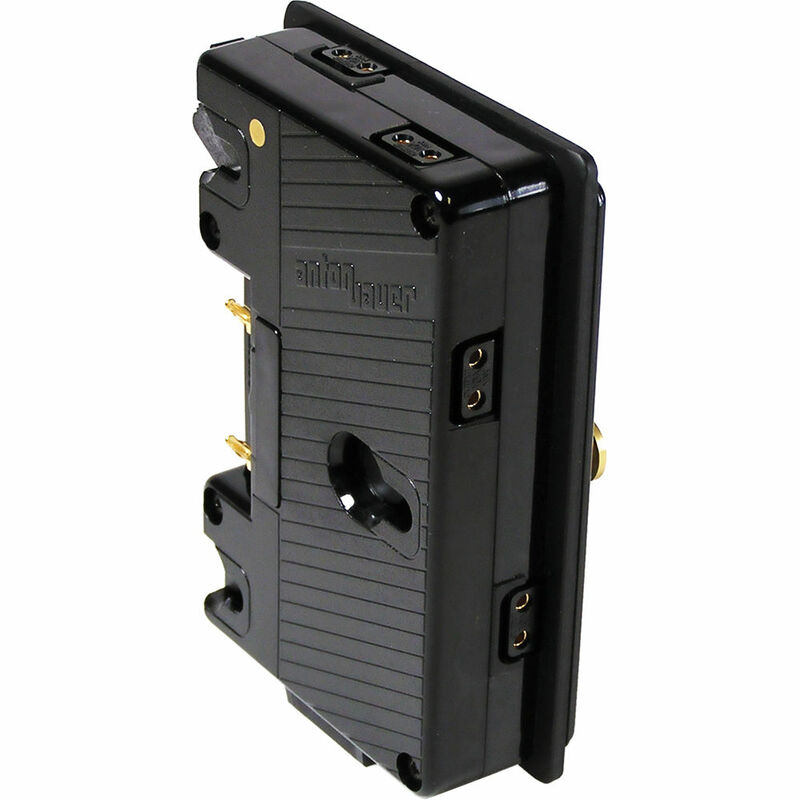 This Anton Bauer QR-QUAD PT Gold Mount Sandwich Adapter features 4 PowerTap connectors making it possible to power 4 accessories. Box Dimensions (LxWxH) 6.4 x 4.1 x 2.2"
4 PowerTap Sandwich Adapter is rated 4.4 out of 5 by 7. Rated 3 out of 5 by Chris P. from Need better design for DSLR power This is designed to be sandwiched between Anton Bauer Gold Mount batteries and plates to provide power for on board devices. It does this perfectly. What I needed was something to allow using Anton Buaer batteries on my HDSLR rig, specifically to power the camera and monitor. While it has plenty of outputs it does not mount to the cheese plate on my rig without modification, thus voiding the warranty. I wish Anon Bauer made a version that would work on HDSLR rigs without modification. By the way, a Switronix cable is necessary to adapt power from this to HDSLR cameras like the Canon EOS 7D and 5DmkII. Rated 5 out of 5 by MM from life saver I'm a first AC and Steadicam operator. This plate is perfect when you need to extend the battery back from the camera to better balance something like a shoulder rig, or even to put it on a Steadicam for better dynamic balance front to back. Another great use for this plate is to power multiple accessories either left or right of the main camera body. Sometimes you need more cable length, or less, and this gives you those options to tighten up the cables and overall look of your rig. And of course the main reason why you want to use this is to power multiple accessories in general. A typical setup I use is the bartech Wireless follow focus, Teradek bolt pro 600 wireless video transmitter, & a small HD 702 7 inch monitor to pull focus from. Rated 5 out of 5 by Anonymous from Great product! Given that this product is meant for use with industry-standard cinema cameras and other camera support equipment, I wouldn't use anything else to add power ports to any Anton Bauer-based camera system. Every time that I have used one of these plates it has been reliable. I am glad to have purchased one to throw in with my accessory rentals. Rated 4 out of 5 by skates from Perfect for powering camera accessories. This is perfect for powering camera accessories that use a p-tap power cable like the NanoFlash, Pix 240 in conjunction with an on camera light. It beats using the old A/B p-tap pigtail adapter by a mile. It allows you to plug in 4 accessories in addition to the one p-tap that is already on most A/B gold mounts. Rated 5 out of 5 by Anonymous from Works great. Bought for use on Alexas and Amiras. Love it. I find it more solid than the original P-Tap splitter. I do put a piece of soft side Velcro between it and the camera to silence the slight rattling it makes. Rated 4 out of 5 by JaiyenDM from Very Handy! Needed an extra tap to power my wireless receivers and this adaptor fit the bill perfectly! Rated 5 out of 5 by Mike A. from I Love the Sandwich! Allows multiple power points for powering remote focus, hdmi transmitters, and the camera! Does this powertap offer different regulated voltages. Ex. 5v, 7.2v, 9, and 12? Does this sandwich adapter be able to mount to the Anton Bauer Matrix Cheese plate directly? The three prongs from the sandwich adapter doesn't seem to attach to the Matrix plate, please correct me if I am wrong. Thanks! The sandwich plate is intended to be mounted on an existing Anton Bauer battery plate to give you more P-Tap outputs. It doesn't attach to the Matrix plate directly. I have seen some people get around this however by disassembling it and attaching it with other screws.